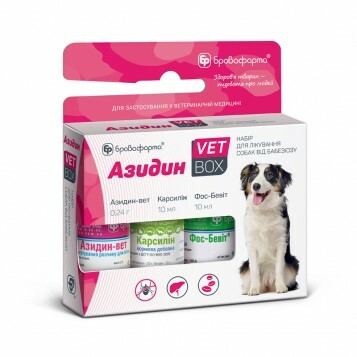 3-products set «Azidin VET-BOX» provides destroying Babesia and helps to recover after the infection. Babesiosis (piroplasmosis) is a seasonal disease, caused by unicellular organism Babesia canis (piroplasma). Babesia is primarily transmitted to dogs through tick bites, and replicates in red blood cells, destroying them. Symptoms of babesiosis: weakness, fever, dark-brown urine, jaundice. The peak periods for disease are spring and autumn. The most of animal die without treatment. Effective against Babesia, has a pronounced therapeutic effect after the first injection. To make a 3,5 % water solution: add 2,5 ml of water for injection to the vial with the powder (0,24 g). It is injected intramuscularly or subcutaneously. The dose is 1 ml of the 3,5 % solution per 20 kg of body weight. The injection is repeated in 24 hours. Hepatoprotector, stimulated regeneration of hepatocytes, renews and protects liver, used orally. The dose is 3 ml per 10 kg of body weight, the course of 10-14 days. Vitamin-and-mineral complex, stimulates hemopoiesis, regulates liver function. It is administered intramuscularly, subcutaneously or intravenously once a day in the dose of 2 ml per 10 kg of body weight.